Give someone the chance to try a selection of Rubies in the Rubble's bestselling relishes with this gift box! A great gift for any foodie. 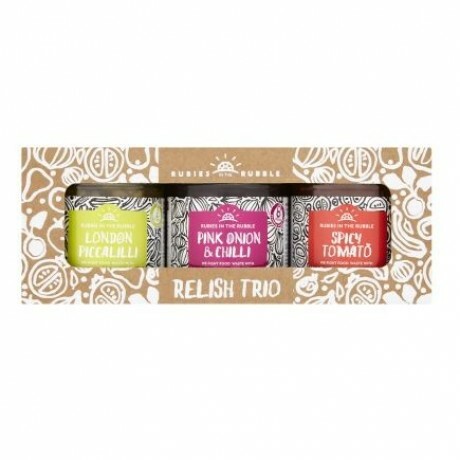 The three relishes come presented in a lovely gift box. Spicy Tomato: Fresh Tomatoes (69%), White wine vinegar, Sugar, Onion, Chilli, Salt, Olive Oil, Fennel, Yellow mustard Seeds, Cumin. Pink Onion & Chilli: Pink Onions (77%), Soft Brown Sugar, Sugar, Red Wine Vinegar, Balsamic Vinegar, Chilli, Salt.